You've probably noticed that I seldom make pies. Indeed, I have to confess...just the thought of trying to manipulate a gluten free, low carb, fall-apart dough into something that remotely resembles a pie crust is quite scary to me. Consequently, I take the easy way out and make something that's sort-of-like a pie, but not really. 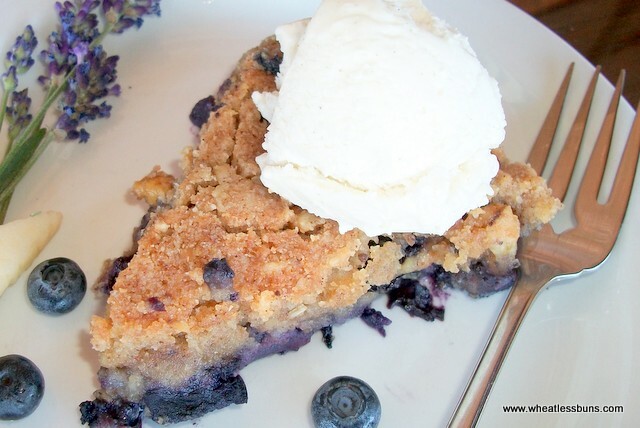 This recipe is a prime example of what I'm talking about--it's non-traditional, i.e., doesn't look like your Grandma's pie, it's easy, and requires absolutely NO SKILLS in pie crust design! I asked Hubby what his favorite pie is. He responded, "Apple." But after a long pause he said, "Maybe blueberry." Apple. Blueberry. Apple. Blueberry. Which one should I make? Well, I resolved this dilemma by making both--in one. So here it is, folks! 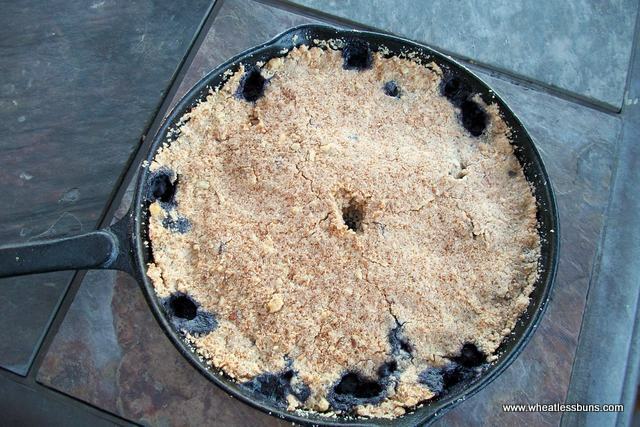 Apple Blueberry Skillet Pie that's really easy and super delicious! And if you just happen to have some low-carb vanilla ice cream on hand, throw that on there, too. 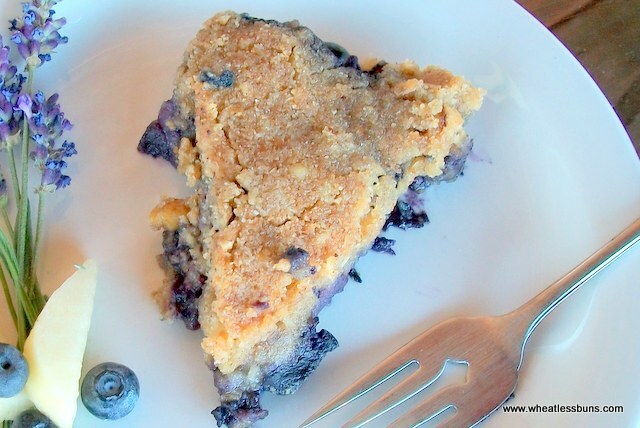 Either way, you'll absolutely love this Grain Free Apple Blueberry Skillet Pie! Hubby sure did!! 3. Melt 2 Tbs. butter in 10"-12" oven-proof skillet over low heat and brush the surface and sides of the pan with the butter. Turn the heat off. 4. Dump the apples into the bottom of the skillet. 5. Dump the rinsed and dried blueberries over the top of the apples. 6. Mix together the first 6 ingredients for the top crust. Then mix in the melted butter and mix well. The mix will be very dry, but don't panic. 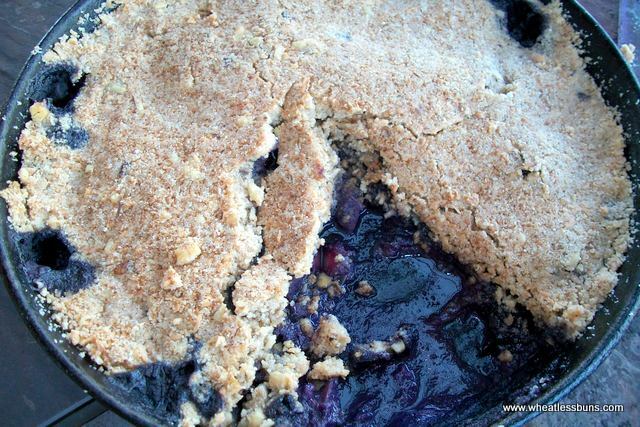 The moisture from the fruit will actually absorb into the crust. 7. Pour the crust ingredients over the filling and pat down. 8. Bake uncovered for 35 to 40 (minutes or until you see the juice from the fruit bubbling up around the edges of the crust. I 'unnecessarily' made a hole in the center of the crust for the juice to bubble out, but it managed to find its own escape route. 9. Allow the pie to cool before serving.